If you like your comics to look pretty, then you’ll enjoy looking at this book. Bloodshot Reborn #12 features some tremendous artwork of the level that you don’t often see in monthly titles (unless the name of said monthly is Bloodshot Reborn during The Analog Man story). This comic is one of – if not the – best looking book(s) that came out this week; the artwork is astounding, and a large part of tha is down to the work of colour artist Brian Reber. Don’t worry, though, the writing’s pretty good, too. Honestly, look at the snippet from one of the preview pages below and then tell me that the unlettered artwork wouldn’t look out of place in an art gallery. That snip isn’t the only example of great art in the comic, but it’s my favourite page that’s included in the preview package, and so I snipped from that knowing that we’re free to show you the scan. 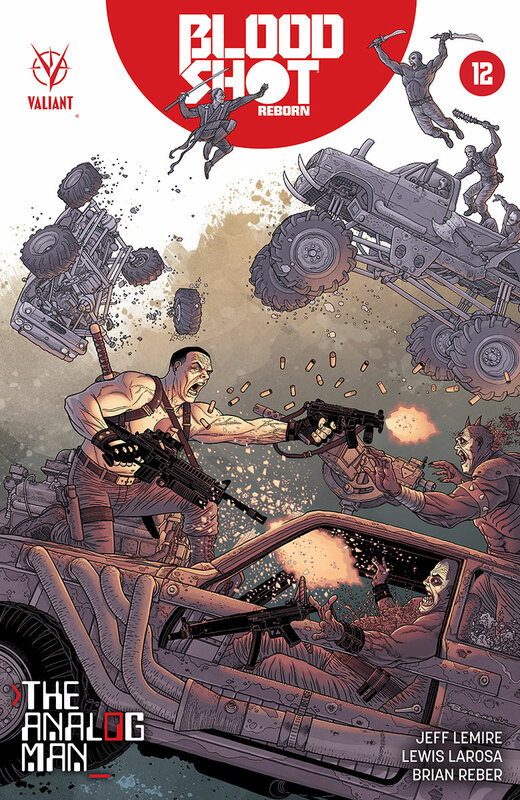 But it should give you an idea of what to expect when you open Bloodshot Reborn #12. My love for the artwork aside, this is still a well written issue that succeeds in building the next chapter without allowing the pace of the story to slow down (I think this issue takes place over a matter of an hour or two at most), which is a trap that can be easy to fall into. If the twelfth issue is any indication, we’re definitely heading to a pretty bloody confrontation in the next couple of issues, and I can’t wait. The Analog Man has been one of my favourite Bloodshot stories yet, and it’s not over yet. Whether you read The Analogue Man in single issue form or trade paperback, with two issues in, this has the potential to be an absolute blinder of a story. This is well worth the price of admission. The same is just as true of this issue as well. You need to read this series, for the art if nothing else.